Vitamin C, also known as ascoribic acid, is an important nutrient and antioxidant that plays a key role in many functions throughout the body. It helps protect against cellular damage, stimulates production of collagen important to healthy skin and joints, aids iron absorption, and supports heart and immune system function. Vitamin C is water-soluble and must be replenished every day. Broccili, red peppers, berries, melons, currants, brussels sprouts, parsley, potatoes, tomatoes, citrus fruit and strawberries are good dietary sourses of vitamin c.
Antioxidant: As a poerful antioxident, vitamin C protects body cells and low-density lipoproteins (LDL) cholesteral against oxidation. Oxidation LDL is a harmful form that can compromise cardiovascular funtion due to its effects on cholesterol. Vitamin C is also needed to recycle vitamin E in the body. 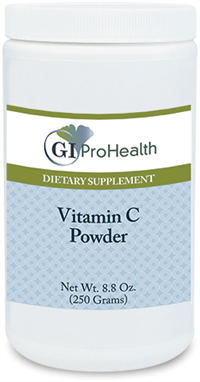 Collagen support: Vitamin C is needed to form collagen. Thus, it is crucial for strength of body tissue such as muscles, bones, tendons, joints and blood vessels, and gums. Vitamin C also plays an important role in wound healing. Immunte function: Vitamin C stimulates the immune system by increasing interferon levels and enhancing the activity of immune cells, such as white blood cells. Vitamin C is suppied as an ultra-fine powder containing 1,000 mg (1 gram) of pure ascorbic acid per 1/4 teaspoon. Vitamin C is free of the following common allergins: milk/casin, eggs, fish, shellfish, tree nuts, peanuts, wheat, gluten, soybeans, and yeast. Contains no artificial colors, flavors, or preservatives. This product does not contain added ingredients.